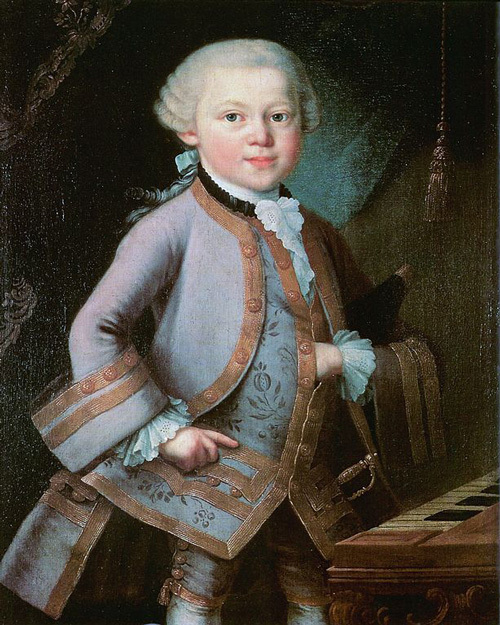 So, you’ve signed up for an early childhood music class. Whether you chose one of the most popular programs, like Music Together, Kindermusik, Musikgarten, or something else entirely, you want to make sure to get the most bang for your buck. After all, you may only be able to participate in one semester or year before you’re trying dance, gymnastics, or sports with your little ones, or the money it costs becomes a burden on your family. Here’s a list to help you make those weekly lessons last a lifetime. Go to class: This might seem like a no-brainer, but if you don’t treat class like a priority, your children won’t treat it like one either. Try to find a class that fits your schedule, which can be tough with preschool, naps, other activities, and not to mention untimely childhood illnesses. However, I think it is worth molding your schedule around a once-a-week class. Infant naps can be unpredictable and changeable, but you’re still only on the hook for class once a week. Try to do everything you can to make it. Bring your sleeping baby, even if it’s just you and the baby. You’ll probably feel awkward, but the baby is still becoming acculturated to music, and you’ll get to learn the songs and activities. You’ll then be able to replicate those activities at home, but not if you didn’t learn them in class first! If baby gets cranky and you have to leave, that’s ok. If you have to spend the whole class nursing, it’s fine! They are still benefiting from being in class. Learn the songs. I know it’s almost like having homework, but it’s worth it to familiarize yourself with the songs so that you can fully participate in class. It also allows you to enjoy the songs on the CDs spontaneously, without having to make sure you have the CD handy! If your children are old enough to learn the songs, getting them comfortable with singing the songs gives them more confidence with participating in class, so then you feel like they are getting the most out of it. Bring fed and rested kids to class. Again, probably a no-brainer, but your child can’t enjoy class if they are tired or hungry. Try to shift your schedule to fit the class and give it your all. Maybe music class day is not a good day to go to the pool from 10am-2pm. Have a snack before class so children are full and ready to sing and play. Steal your teacher’s ideas. Did the teacher plan an activity that your children absolutely loved? Recreate it! If there was a certain prop, ask her where to buy it or make a version for use at home. Sing the song and play the way you did in class. Do you like the new lyrics that the teacher made up? Use them yourself. Don’t worry, we won’t sue. Sing the tonal patterns that you learned in class with your children after you finish singing the song together. Start singing directions at home and see how much faster your children clean up! Copy the body percussion the teacher used during the rhyme. You’ll make music at home more fun, and you’ll be connecting what you do in music class to music-making at home for your children. Put in requests to your teacher. Your teacher has a lesson plan for class, but she might be able to fit in a round of your favorite rhyme or song. If she can’t get it into that day’s lesson, I guarantee she’ll try to fit it in more lessons than she would have otherwise, just because she knows you and your children like it. If your teacher doesn’t normally take requests, maybe send her an email letting her know the songs and activities your children appreciate most. Have fun! If your children see you having fun, they’ll have more fun, too. It will also show them how much you love music. Give it time. 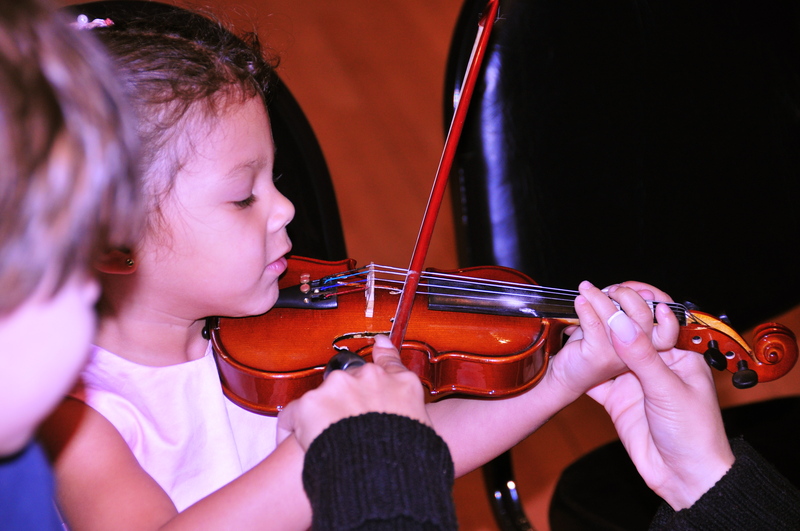 While participating in early childhood music classes will have long-term benefits for your children’s musicality and brain growth, the products of this education might not manifest themselves quickly. Your child might be badly behaved during class, or maybe they don’t participate at all during the lessons. There is usually something behind this that the child is working through. You may have to take a break from music classes for a while, but I urge you to try again. Maybe when your child has become more comfortable with his singing voice, or maybe she is more comfortable around new people. If you started in the Fall, sing those songs at home all year long, then come back in the Fall of the next year and maybe they will be happy to sing and dance to those songs. Some children just need more time. You wouldn’t pull them out of kindergarten for being shy or getting into trouble once in a while, so don’t halt their musical education! If a class environment isn’t suited to your child’s needs, try to adapt the songs and activities to your life at home. If you’re not sure how, ask your teacher! I’m sure she won’t mind helping, even if you’re not enrolled. Most of us are passionate about music and education, and wouldn’t miss the chance to help a child make music! I hope these tips were helpful. 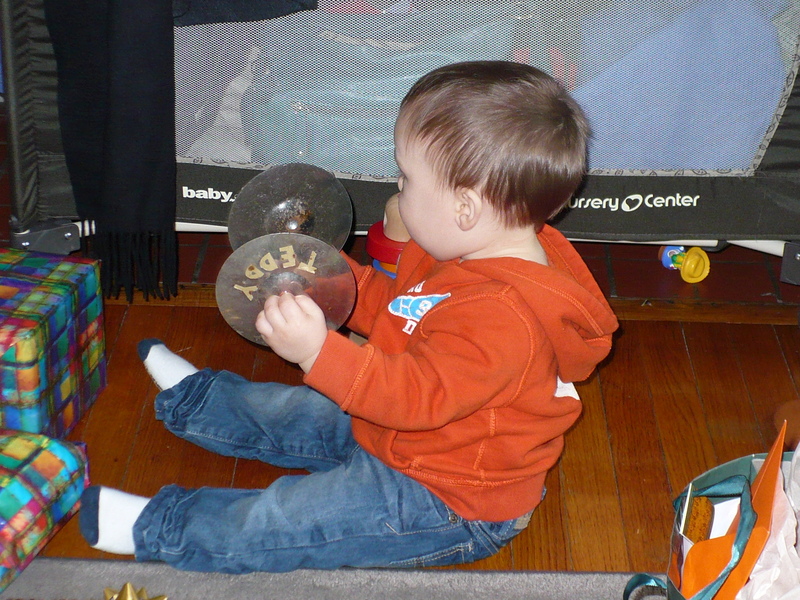 Do you have any more tips to add from your experiences in early childhood music classes? Ok, now what am I supposed to do? Alright, you’ve committed to being more musical at home. You sing more, dance more… but what else could you possibly do? How about enjoying some musical prop time? 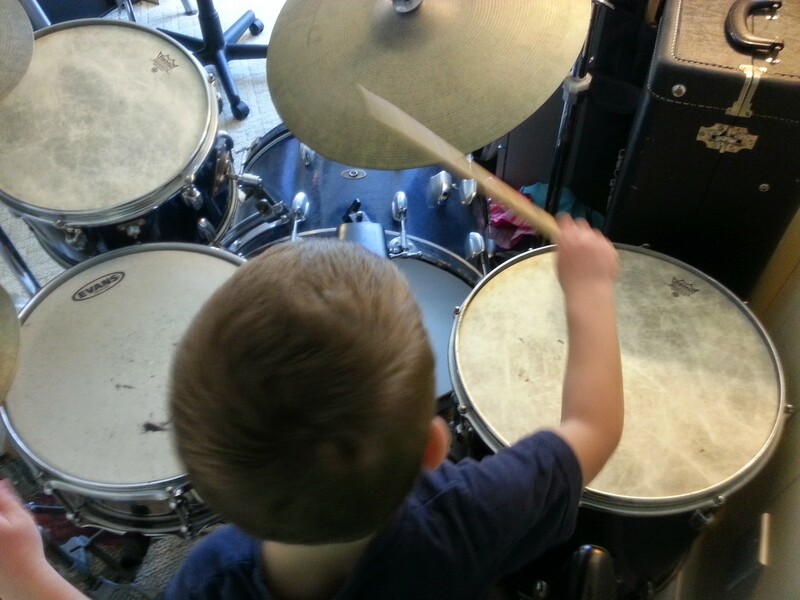 It’s a great idea to have some instruments just for your kids that are kid friendly, like shaky eggs, drums, and small percussion instruments. You can put on the CD player or sing your favorite songs and play along. 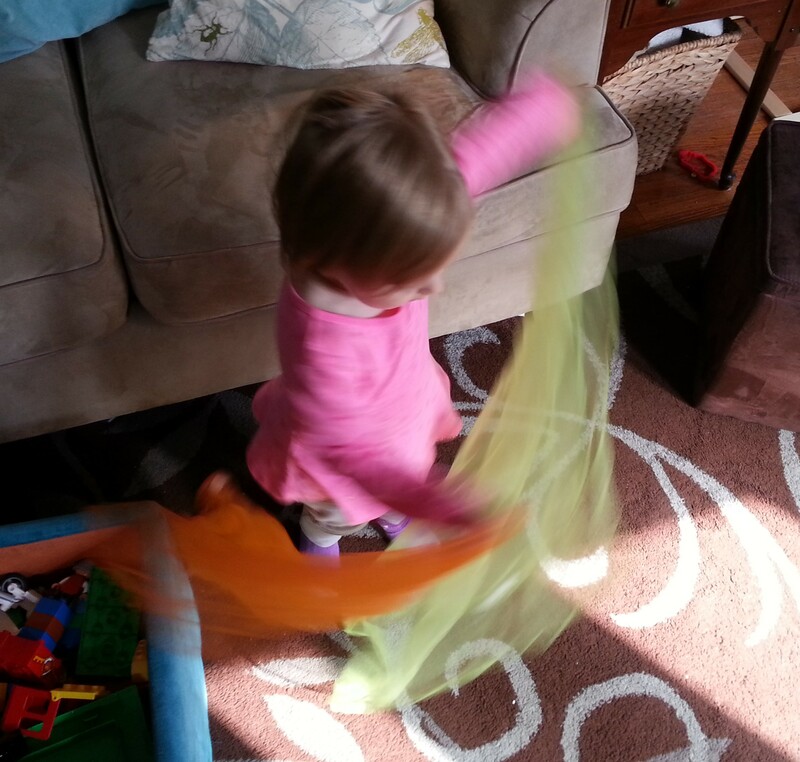 You can also encourage musical movement by dancing with scarves. If you are feeling adventurous, like some of my local mom friends, you can conduct your own preschooler ensemble! The kids were given simple directions like when to start, stop, get louder or softer. They had tons of fun and it is very simple to put together. If they don’t follow the directions, that’s fine, too. They can work on their beat competency while the song is going on. Check out our little ensemble below! *Thanks to the mamas that helped with the video and donated their kids and their time to this blog post!